There is one decent Australian cricketer currently in England. While his international-standard (allegedly) countrymen were completing their whitewash drubbing at the hands of England, Ramsey’s man from down under Jake Towerton was blasting a personal best double ton which included that rare feat of six sixes in a single over. Jack Berry cracked an unbeaten 56 for Bourne against Grantham. Towerton blasted 18 sixes and 21 fours in an innings of 218 not out in a Rutland Division Two match at Uffington today (June 24). The boundaries are small at the village ground, so small Towerton (23), who is an unpaid overseas player workings in a carrot-packing factory, managed to lose 16 balls through his mighty hitting. Towerton’s knock was a career best by some distance beating 168 he scored in his homeland. He also bashed 163 in a Hunts League game against Hampton seconds earlier this season. Ramsey had been set a stiff 45-over target of 288-4, but they scorched to victory in just 29 overs. Towerton completely overshadowed the 136 scored by Uffington opener Guy Cunningham. Josh Bentley was the bowler to see every ball from one over struck for six. In Rutland Division One the top three all won, although title favourites Ketton Sports almost lost their perfect winning record to some remarkable hitting from Oundle’s Conor Craig. 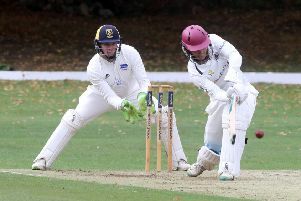 Craig smacked 98 from just 76 balls, a knock that included eight fours and six sixes, as Oundle chased Ketton’s 202 all out, but he received precious little support with no other player reaching 20 as the home side fell 38 runs short. Iresh Saxena (5-39) included Craig in his list of victims. Earlier Ketton had wasted a strong start from Pete Rowe (84) which saw them reach 145-2. Barnack remain top after beating a second string Peterborough Town team by 136 runs. Fifteen year-old leg-spinner Karanpal Singh claimed six wickets for Town. Bourne are third after easing to a seven-wicket home win over Grantham. Jack Berry (56no) and Jordan Temple (54) made light work of Grantham’s 173. Barnack 224 (Y. Mirza 47, U. Mirza 44, A. Akhtar 36, T. Ahmed 26, K. Singh 6-67, T. Ali 2-25). Town 88 (K. Singh 35, A. Akhtar 4-25, M. Shahid 3-49). Grantham 173 (S. Lythgoe 44, A. Cornwall 2-15, T. Dixon 2-15). Bourne 177-3 (J. Berry 56no, J. Temple 54, Q. O’Connor 41). Ketton 202 (P. Rowe 84, S. Mahmood 43, Z, Manzoor 37, H. Craig 4-48, C. Craig 2-25). Oundle 164 (C. Craig 98, I. Saxena 5-39, P. Rowe 3-19).